The theory of mulleriosis proposes that the cause of endometriosis lies in developmental abnormalities in the female reproductive system. It proposes that endometriosis occurs due to abnormal differentiation or migration of any component of the mullerian duct system. 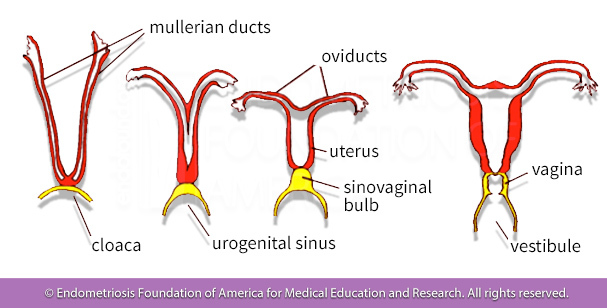 This system is a channel in the early embryo that goes on to develop into the fallopian tubes, uterus, and cervix. The development of the uterus is said to play an integral role in the cause of endometriosis, according to the theory of Mulleriosis. How do these abnormalities in the mullerian duct system arise? While supporters of the theory of Mulleriosis certainly do not dispute the developmental component of endometriosis, there is debate as to how these abnormalities arise. Many propose a strong genetic component, wherein individuals are predisposed to abnormal development due to genetic inheritance and/or gene expression. Others stress the importance of cell migration and the movement of embryonic cells, along with effects of their differentiation. Are there specific genes that could play a role in the embryonic origin theory? 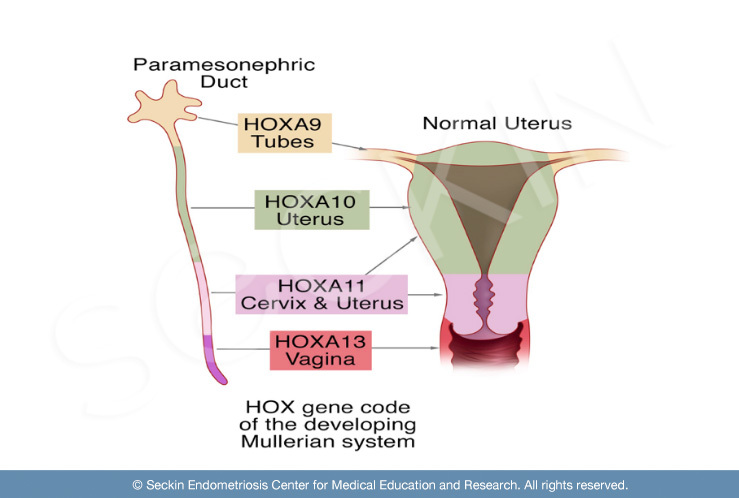 One common set of genes that are of particular interest in endometriosis development from a Mullerian perspective are the HOX genes. These are a group of related genes that are key in early development as they control the body plan of an embryo. HOX genes are of particular interest to endometriosis research in their function in developing the endometrium, both in the early stages of human development and during one’s menstrual cycle. Some studies have shown that endometriosis patients fail to show an expected rise in HOX gene expression, suggesting that altered development of the endometrium (lining of the uterus) may contribute to a woman’s susceptibility to the disease. This is of a particular interest to not just those studying endometriosis, but also fertility specialists as uterine abnormalities are a subject of great discussion in infertility cases. The role of the HOX gene in the development of the uterus is of great interest to those studying possible genetic causes to the development of endometriosis. Mulleriosis has not only been applied to endometriosis, but perhaps more commonly it is linked to uterine anamolies. These are uterine malformations that often form from abnormal development. Most commonly, these differences have been associated with chronic pelvic pain and infertility cases. Structural differences of the uterus can also explain painful peristalsis (menstrual flow) and abnormal outflow of menstrual debris, which some propose links to the theory of retrograde menstruation. What is metaplasia and how does it relate to Mulleriosis? Metaplasia is defined as the transformation of differentiated cell types to another cell type. In short, it is an abnormal change in the function of cells. Researchers have often speculated the role this process can play in endometriosis development. It is believed that embryonic cells from the Mullerian duct can remain even after development, and implant into ectopic regions, forming endometriotic lesions. These lesions will then respond to estrogen when a woman first has her period in her adolescence. This theory is called the Induction Theory or Coelomic Metaplasia, in which hormones, immune signals, or some other factor causes the transformation of peritoneal cells (cells that make up the lining of the abdomen) into endometrial cells. However, this idea has its critics as it does not explain how endometriosis can develop outside of the Mullerian duct system, such as the intestines, peritoneum, etc. How does the theory of Mulleriosis connect to stem cells? Due to the limitations of the Mulleriosis theory, namely the presence of endometriosis in regions outside of the fallopian tubes and ovaries, many have proposed other hypothesese. However, the concept of metaplasia playing a role is still supported even by critics. Thus it has been speculated that instead of specific mullerian duct cells being transformed, perhaps this process occurs earlier in development with embryonic stem cells. More commonly, many have proposed adult mesenchymal stem cells being responsible for abnormal development of the uterus and subsequent endometriosis development. Thus, we see once again, that many theories speculating the cause of endometriosis often end up interacting with one another, ultimately supporting a more multifactorial etiology. Can endometriosis be identified before puberty if it is an issue of early development? Some have proposed that if endometriosis is caused by abnormal development during the fetal period, then it should be able to be spotted before adolescence, which is when women typically start feeling their symptoms. Some studies have thus looked to examine ectopic endometrium tissue in fetuses during different stages of development. These studies examine the location in which the suspected endometriosis tissue is found as well as its characteristics, much like a pathology report. While these steps are towards the right direction, more study and funding is needed before any conclusions can be made. Grimstad FW and Decherney A., “A Review of the Epigenetic Contributions of Endometriosis.” Clinical Obstetrics and Gynecology. 2017 Sep; 60(3):467-476.